There i was, a lone traveller waiting for the tour bus. As the orange bus pulled over, i hopped in only to find all the seats taken. There was just one left, right at the tail end.. Hopped across, and plonked in the seat, and was lost in the sights outside... Few minutes later when i turned towards the Guide's voice, i was surprised to see 3 curious faces staring right at me..
Oh well, people~!! Guess they are just surprised to see a girl, a girl traveling alone, a girl traveling alone in Goa. Man2: You love photography? I saw you taking lots and lots of pictures.... I don't have a camera, but wish i could show some of these places to my daughter, she will love them. Man 1: Ummm.... dont mind me, but how can i get a copy of these pics ,madam? To my phone? how madam? Well, you can see emails on your phone right? i shall mail them to you..
Man2: oh wow, here is my phone. please do take my email and send them no..
Me - had a *totally surprised and "wow, such innocent ppl do exist"* moment. A single line reply that i checked on my Blackberry " Thank you so much madam, the places look so lovely, take care... xyz"
The power of Internet... It is so vast, it is so magical, and yes, it is amazing connecting us to those across miles.... So easy and so much fun~!! I've lost count of the number of times i have visited this town, back in the days we used to do weekend trips, just drive down, stay with a friend, enjoy the weekend and head back to Chennai to face Monday. The most recent visit was last year- September, around my Birthday. 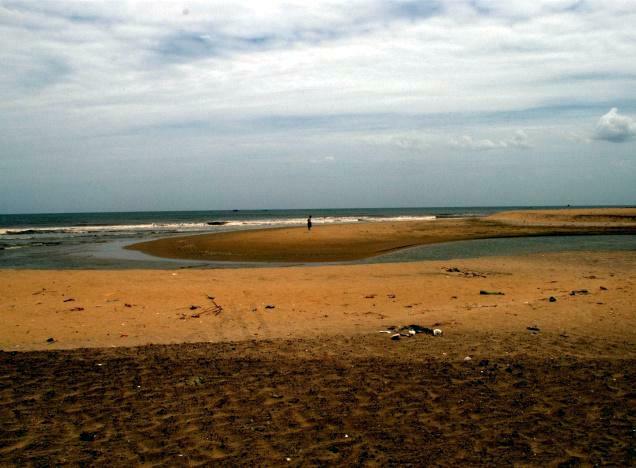 I was back in this quaint French town called Pondicherry, 4hours from Chennai and a place that welcomed me with open arms every time i landed here. Even though it was September, the sun was blazing down with glory, no consideration for us poor souls melting away here. 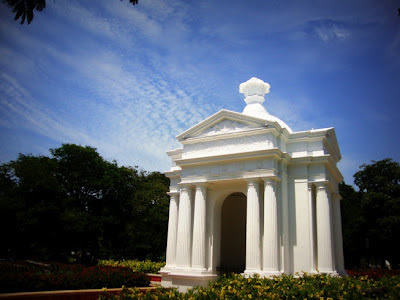 Having decided to see more of Pondicherry and gain some insight into the architecture and history, i had signed up for an INTACH walk. Armed with a bottle of water, camera and thirsty soul i was ready, i walked towards the lobby to find Mr Ashok Pande waiting patiently. We started off with a walk through the narrow lanes, most of which looked alike, with houses neatly stacked beside each other, some sporting name plates dating back to centuries gone by, while others had been restored and put to better use today. Whilst walking i mentioned the park that i kept crossing every time i went to the beach or to Mission street, it was almost like the park had to be met at every outing. Ashok said "worry not, we are heading there as we speak" and lo behold, there it was around the corner. It is a Government park, that was once open with no gates and through which cars could drive straight through. Now, there are iron gates that are kept shut, and cars will have to go around the park. As we walked in, i noticed the cobbled pathways and beautiful pillars. 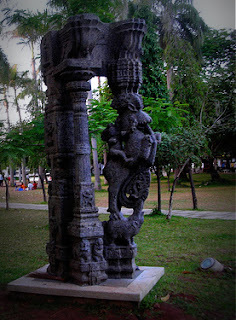 These pillars have all been brought in from ruins around the city, they looked right out of one of our temples. The park is circular in shape, and standing proud right in the center was a Monument, an arch, one that was called "Aayi Mandapam". At first glance, it looked like a smaller simpler version of the Champs-Élysées[no no, not been to France, just seen enough movies to identify the landmark monument], but then upon close inspection i learnt that it has been built in the Greco-Roman architecture. The monument was erected during Napoleon III's reign [Emperor of France] . 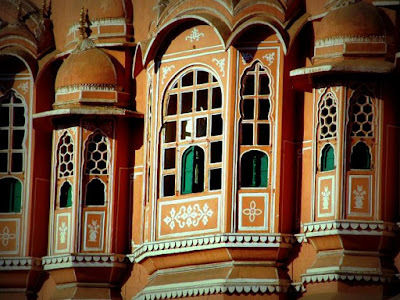 Situated right in front of the Raj Niwas, the residence of the Lieutenant Governor, the park is quite a majestic place. Wow, that was quite a story. While i captured a few photographs of the place, i noticed 2 children running around the garden, with their mother screaming at them to come to her. There was another old couple sitting on the park bench, silently, as if words were no longer needed.. The park was brimming with action, and i walked around it towards the other exit looking forward to discovering more such hidden treasures in Pondicherry. 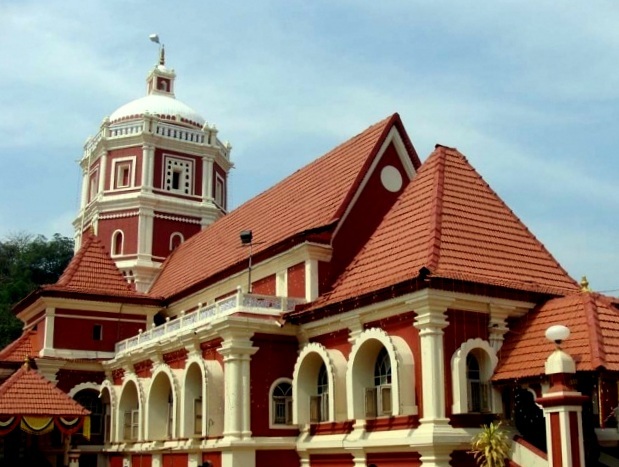 I was just beginning to understand what made Goa so rich in history and culture. It was my 3rd day and i waited outside the resort for the tour bus. I knew we were going to visit a few churches and temples, apart from beaches that day. The one temple that i had read about was part of the itinerary. The Shanta Durga Temple. The day was mighty hot and i lost count of the number of bottles of water i had gulped down. But when the bus pulled up into the parking lot, i was the first one out and off. Situated at about 33 kms from Panajim, The Shantadurga temple is home to the Goddess Durga. She is said to have mediated between Lord Vishnu and Lord Shiva during their raging fight. So, in this temple she is flanked on either side by the two Gods. It was quite a walk from the parking lot to the temple, and again another short one from the entrance to the main temple premises. Walking barefoot, i literally trotted trying to manage the heat under my foot and the sun blazing from the sky. 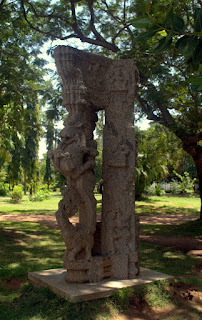 There was a tall tower of sorts near the main building, which is a structure i heard was common in temples in Goa [the other famous temple Sri Mangeshi Temple also bears a similar structure]. 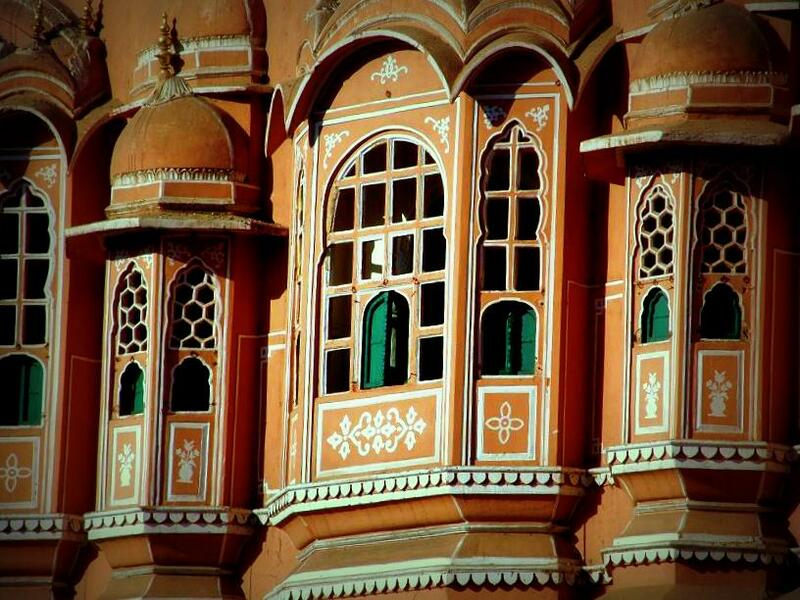 A man who was sitting along one of the walls saw me and took it upon himself to tell me a bit about the temple. The temple was built during the reign of Maratha ruler - Shahu Raja of Satara, who had received a request of the Naro Ram Mantri, in 1738 A.D. The shivalinga here at the temple is said to belong to the Mahajans [the community with the surname 'Vorde' who are the Kulavis]. He went on to say the temple is also called Shanteri Temple. The main deity in the sanctum was Goddess Shanta Durga holding 2 serpents, one in each hand [representing Vishnu and Shiva]. The original place of Shantadurga devi was at Keloshi. 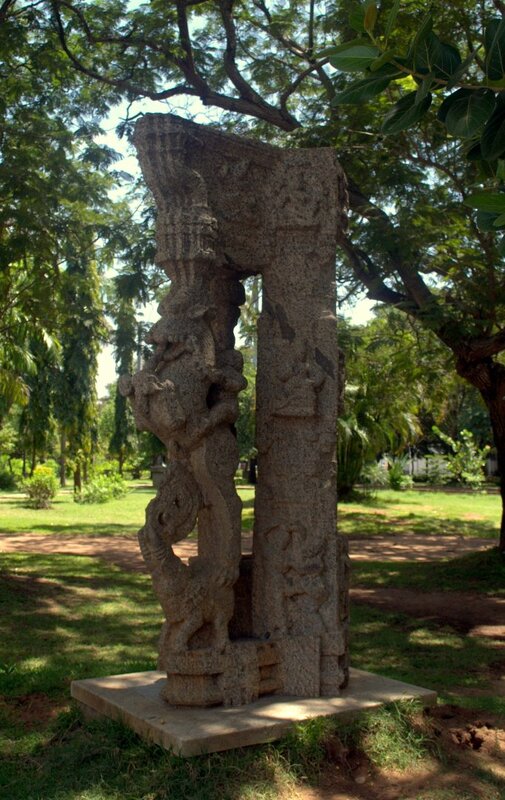 However, during the Portuguese inquisition of Goa, the temple was destroyed forcing the trustees of the Shanta Durga temple to take a decision to shift the main idol to Atrunja taluka for safety. 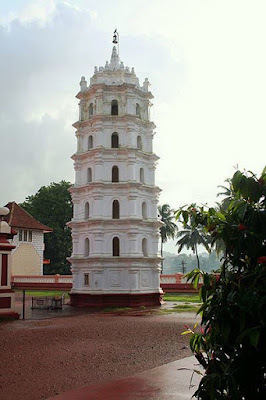 The tower i mentioned near the entrance is the 6 storeyed Deepasthambha and a Ratha (chariot), which is found in all temples across Goa. 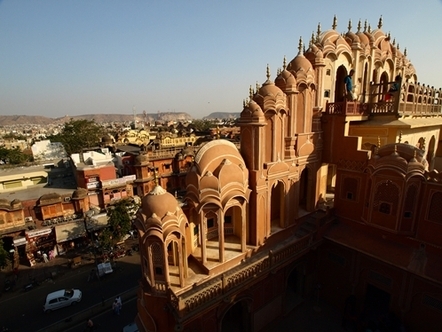 The temple also has a dome, which is fairly unique for Hindu Temples. This is one of the few temples where Harijans are permitted to enter the main sanctum sanctorum. I suddenly heard someone call out my name and realised it was time to head back to the bus. I walked down the slope towards the parking lot watching hundreds of tourists and locals march up the slope chattering away. "Poompuhar welcomes you" was the signboard i saw up ahead. We were really here and headed towards the delta. The town bore a sleepy look, probably because it was a Sunday afternoon. 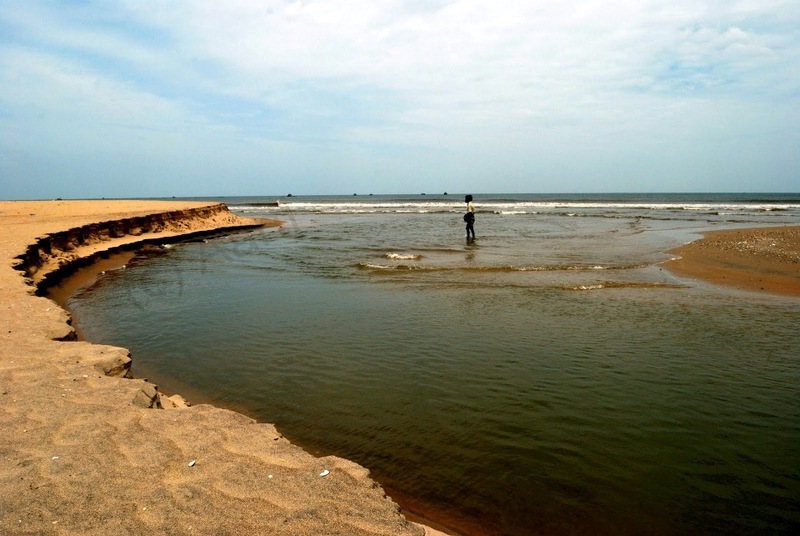 I remember studying about Cauvery poompattinam back in high school Tamil lessons. There were a few kids running about, some playing cricket under the blazing sun, while others sat around half asleep. As we drove on, we passed by three arch ways- 1st was Nalan, then came Dhamayanthi, and there was a 3rd one, i cant recall the name on it though [will come back update once i do remember].. Finally, we reached the road that ran parallel to the delta, all the way to a small temple. We parked the car and began walking on the sand, the sun beating down on the us the whole time. The sand was nearly black in colour, but fine as can be. At a distance we saw the Cauvery river where a couple of fishermen were taking a quick bath before heading home for lunch. And on the left, we saw the ocean, the waves gently sweeping into the delta and welcoming the river. What a beautiful sight that was. it formed a small canal of sorts with sand shore on either side. A man i noticed came walking from the other side, wading through the water towards us. The sand we were walking on was fairly soft, wet, and looked like it would cave into the ocean any moment... It was quite a memorable moment being there, soaking it all in. With not a single soul in sight, i enjoyed being there with nothing but a few crabs trotting about on the sand and the sound of the gentle waves. It was hot, and no, it was not summer. It was October, and it was hot.. Yes i know i said it before, but i want you to understand how hot it really was. 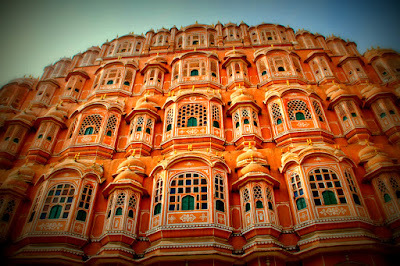 We had just arrived at Jaipur and all we could think off was "where can i get some cold water, or maybe an ice cream.. Damn, its hot". We were 4 of us, actually 5, if you count the nincompoop we had for a driver, a young brat who was supposed to be driving us around, but who ended up putting his legs up [no, i kid you not] on the dashboard and going off to sleep, with the car parked in the middle of nowhere. When one of us woke up from our slumber, we would notice this, ask him to move and then the stranger who became a friend would take over the steering wheel. "Built in 1979 by Maharaja Sawai Pratap Singh,, the "Palace of winds" was designed by Lal Chand Ustad in the form of the crown of Lord Krishna. 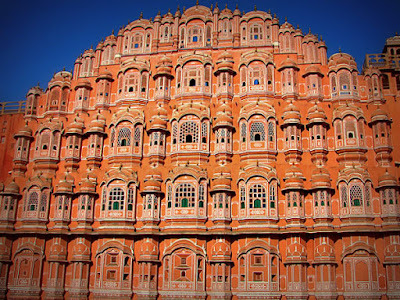 The unique 5 storey exterior resembles a honeycomb and is made up of 953 small windows called jharokhas decorated with intricate lattice work. 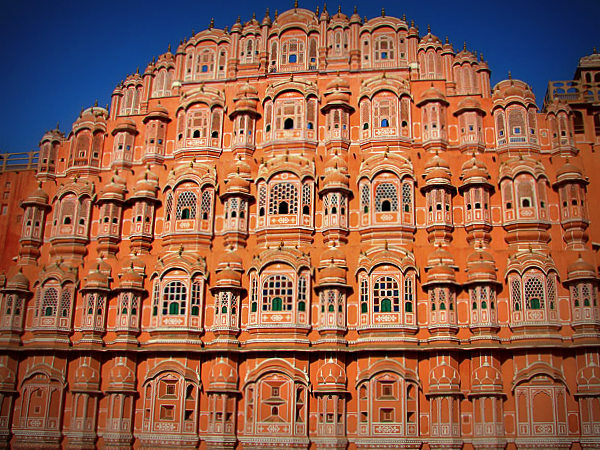 Entirely built of bright Pink and Red sandstone, the palace is a landmark in Jaipur, renowned for the rich architecture and style. We walked around the place, listening to the tales narrated by a guide to a group of foreigners, and made our way to the top, from where the entire city seemed to be visible. Time stood still until we suddenly realised the harsh evening sun was beating down on us and made our way out. The city was bustling with visitors and locals, there were construction workers busy with the repair work on one section of the Hawa Mahal.